William H Seward Jr. was the third son of William H Seward, one time Governor of New York, Senator representing N.Y. and Secretary of State under Lincoln. Wanting to make himself outside his father's shadow, he went to Albany in 1857 and honed his management skills as a clerk in a hardward store. In 1859 when his father went to Washington as a State Senator, he went with his father as his private secretary. He teamed up with his close friend Clinton D. McDougall to form a banking house in Auburn, NY, the William H. Seward & Company bank. 1860 saw the marriage of William Jr. to Janet M. Watson and for a short time they lived at 118 Owasco Street. He was appointed by Governor Morgan in 1862 to the war committee. with this assignment he became very active in enlisting and forwarding troops from this section of the state. By August he left his new banking business and accepted an appointment of lieutenant-colonel and he organized the 138th New York Volunteers, which by September was changed to the 9th New York Heavy Artillery. The 9th New York was assigned to the 22nd Army Corps in the defence of Washington, D.C. Seward and his 9th took part in building many of the defenses around Washington. One fortification, Fort Foote, still stands as a national historic site. At that site Seward was honored by his men by the presentation of a $350 sword "as a memorial of theri high appreciation of your impartial justice, their confidence in your unflinching courage and their admiration of your exalted leadership." President Lincoln sent Lt-Col. Seward on a secret mission to New Orleans in 1863. Seward was promoted to colonel in 1864 and the 9th Heavy Artillery was reassigned to the Army of the Potomic at Hanover Court House. That was part of the 2nd Brigade of Rickett's 3rd Div. 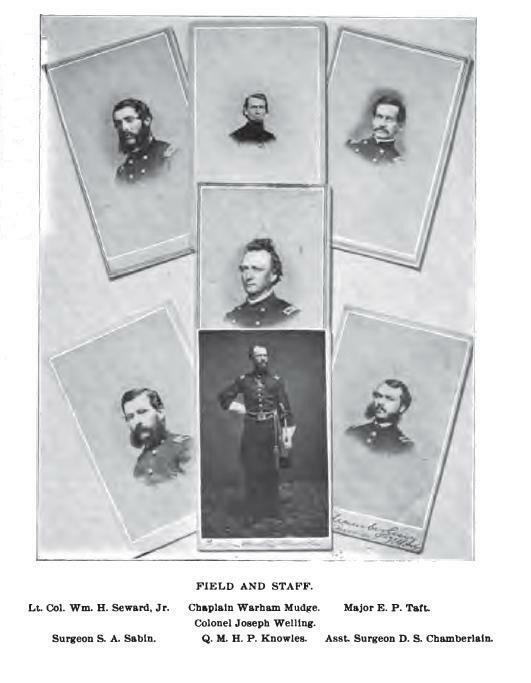 of Wright's 6th Army under General Grant. In July of 1864 Union forces Under General Wallace and General Rickett threw up a blockaide along the Monocacy River, outside of Frederick, Md in hopes of delaying a Confererate advance on Washington. Seward was wounded in the arm, and while commanding his men, his horse was shot out from under him, the fall breaking Seward's leg. The Union forces were forced to retreat, but their actions delayed the Confederates' advance on Washington by a day. This delay allowed for reinforcements which saved the city. Seward himself was force to retreat from the battleon a bridleless mule. This heroic action by Seward won him a promotion to Brigadier-General. 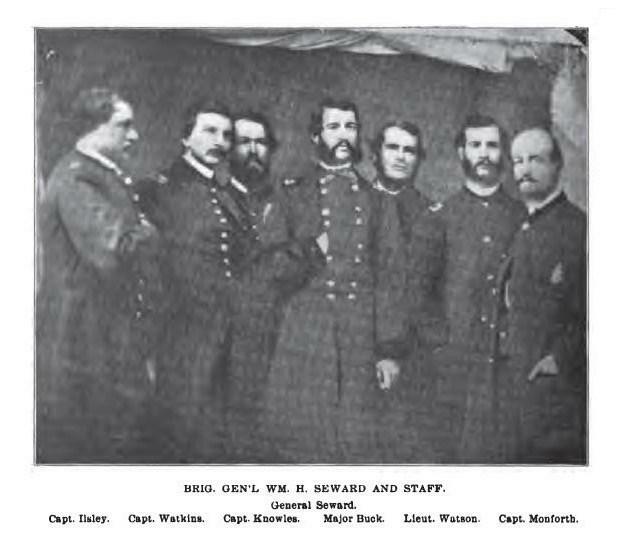 After his recovery, General Seward was sent to Martinsburg in command of the 1st Brigade of the 3rd Division Department of West Virginia operating in the Shenandoah Valley. With General Cook having been captured, Seward assumed the command of the entire division at Harper's Ferry. 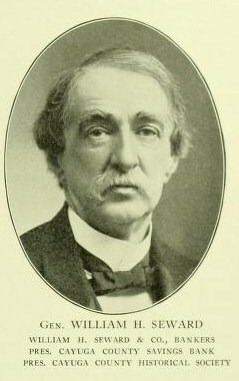 With the end of the war Seward resigned his commission and resumed his place at the head of the banking house in Auburn. Seward was not near the politician his father was. He was still very active in community affairs. Auburn City Hospital, Wells College, Cayuga County Savings Bank, American Express, American Geographical Society and many other interests took up his time. At his own expense he established reading room for working men. His wife Janet died in 1913 after an extended illness. He was survived by his three children, Cornellia Allen, Frances Messenger, and William H Seward, III. 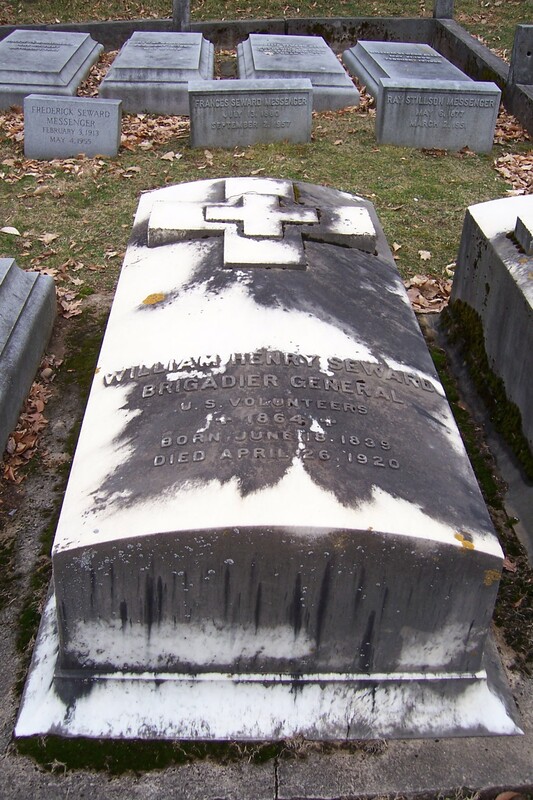 General William H Seward Jr is buried in the Glen Haven Section of Fort Hill.